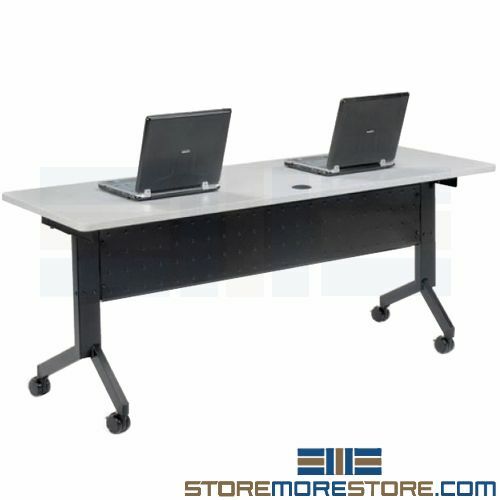 Mobile folding conference tables are an easy way to quickly set up workspaces when and where you need them, and store them in a compact space when you don’t. Simply fold the tables out and roll them into place and nest them together when you’re finished. When nested together, the tables take up only a fraction of the space. 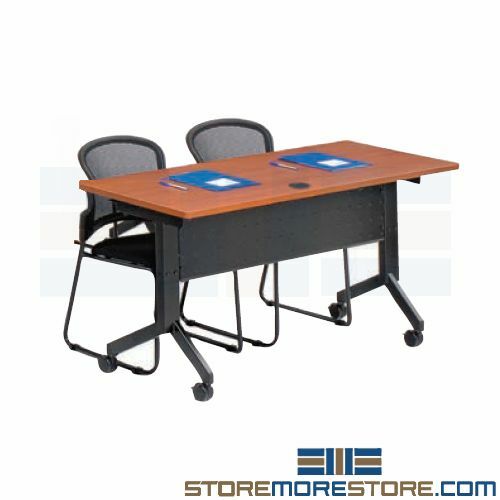 The mobile folding conference tables are ideal for use in classrooms, training rooms, meetings, offices, and much more. Each table also includes two ganging clips, which allow you to connect the tables together. This allows you the flexibility to create tables of multiple sizes for a variety of applications. Since the tables are on wheels, it’s also easy to transport them where they’re needed. Additionally, the tables include 1″ thick laminate/particle board tops and PVC edge banding that adds stability and a smooth, finished look. A metal modesty panel with an integral cable trough also keeps cables neat and tidy. Mobile folding conference tables are available to buy online and ship within 5-7 business days with free dock-to-dock shipping included. If you need any assistance or just want some help picking the right solution for you, please call us at 1-855-786-7667.